My family and I love to grill. We grill outdoors very often during the summer and spring. A little harder to do this time of year since most of the time it's super cold or rainy. However, spring time is right around the corner, so you know we'll be back at it again. Have you ever heard of the GrillFella? Due to the crazy winter weather, we have only been able to use our Grill Fella a few times. Each time, though we loved it. I think it's great that there is a divider in the middle. I usually put sliced zucchini, peppers, onions, and even mushrooms on one side. Then I like to grill pineapple on the other side. We own another Grill Fella and I'll usually throw in some shrimp, or little pieces of chicken, fajitas, or even fish for the other members of the family. Sometimes I'll take out the divider and grill big bean burger patties or big portabello mushrooms. Oh my gosh. It works extremely well. What's also pretty neat is that it really does make it easier for certain smaller foods because you don't have to worry about little pieces falling into the grill anymore. Yay! The small silicone pads are a nice touch as well and yes, do make it easier to handle the wok, especially when it's super hot. Wouldn't want to burn yourself! 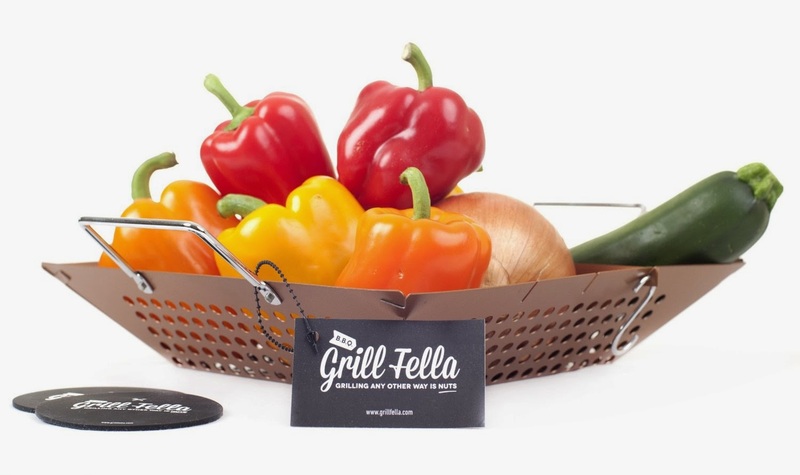 You can purchase your own Grill Fella on Amazon. Multiple colors available.